Feeling depressed in the wintertime can make the season less bright. Isolation and a desolate landscape can have the worst effect on some people. Rather than letting it get you down, find ways to be positive instead. Working out regularly, eating right and exercising your mind are smart ways to keep the winter blues away. Slowly incorporate fresh fruits and vegetables such as kale, spinach, oranges and pineapples into your diet. Physical exercise can help ward off hopelessness. It’s not always practical or fun to head outdoors in the cold so stay in. Try light, relaxing exercises like yoga to maintain peace in mind, body and spirit. Brain games like Sudoku or Chess work out the mind for better focus. It may not be necessary to torture yourself by enduring the long winter months. Vacationing is an exceptional choice for you if you’d rather have summer all year long. You’ll also have a chance to get some vitamin D by staying out in the sun. Stay safe in the sunshine by protecting the skin with sunscreen and maybe an umbrella. 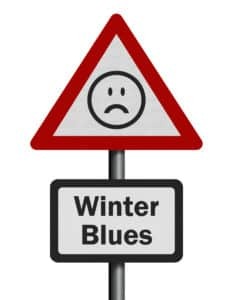 Research suggests not getting enough sunlight in winter can affect the body’s natural clock and cause SAD (seasonal affective disorder). Using a special lamp that emits artificial sunlight can be helpful for those who miss the outdoors. These lamps can be used in an office. Get light therapy without going outdoors. Motivation is one vital way to keep from letting winter blues bring you into the worst state of mind. Don’t let hopelessness beat you down. Make plans to motivate yourself for a better future. See a movie, try out a new vegan restaurant or take a class to learn something new. Join a group that takes place indoors such as pilates, yoga, Zumba or kickboxing. You can even plan for a simple activity like watching a movie or reading a favorite novel in the comfort of your home. Friends and family provide the support everyone needs to stay sane in the worst of times. Socialize by inviting them over or go out to see a play or other activity. It’s important to know that they probably need you just like you need them. The winter can make anyone have thoughts of suicide, be depressed or have anxiety. You can make it fun by writing letters or sending postcards. Seeing people in person is the healthiest option though. If you experience extreme emotions which affect your everyday life in a negative way, seeking therapy is an option. A trusted therapist can help you sort out your problems and put you on a better path. Group therapy is a great option for people who like socialization. If you absolutely hate the winter, remember that it will pass. There’s always a way to improve the worst issues. Keeping healthy is simpler when it becomes routine. Commit to eating healthy, exercising and taking care of the spirit for overall well-being. Winter may be the perfect season to gain some positivity. You can think of it as a challenge to be a better you. Talkspace is an online therapy app which can be used on your device. A trip to see a traditional therapist is no longer necessary. It may be less stressful to talk to a licensed therapist with the app.